These photos were taken on Thursday September 29 at 10:20 AM. The location was at an automotive body shop in Bethesda, Maryland. The "Take It!" came from Taylor having been the lucky recipient of a hit by a flying highway repair lane separation pylon when driving on the Washington Beltway. I say "lucky" as he saw the car in front of him, hit the pylon and kick it up into the air. Taylor was able to swerve and avoid having the pylon hit the windshield. 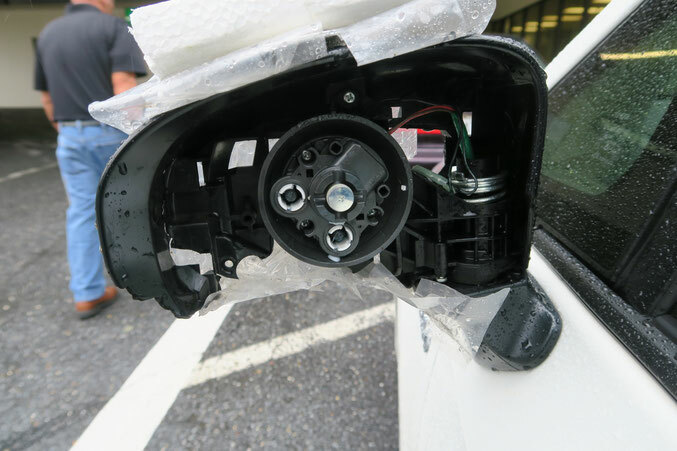 The rear view mirror on the outside of the driver's side door was the only thing damaged in the incident. I commend Taylor for his lightning quick reaction and driving skill to keep this from having become a far worse incident. It shook him up a bit, but his recovery was complete by the time he showed it to me at the end of the day. The most important thing was that he was not hurt. The After Take: I found the car a bit awkward to drive with this ever so important rear view mirror out of commission. There were the inside rear view mirror as well as the outside passenger side mirror available, but it just needed more vision capability. The answer came to me after a few days and resulted in my taking a piece of Styrofoam and smooshing it into the exposed innards of the mechanicals from the broken mirror. This accommodated the irregular surface on the back side of the foam and left the other side which faced backward toward the rear of the car, as a flat surface. I stopped by an auto supply store and purchased a medium sized fish eye mirror. This new mirror comes equipped with an adhesive strip on the back which I pressed onto the exposed flat side of the foam. I then adjusted the angle of the foam with another push, to get the mirror to provide an acceptable rear view. Once all of this had been done, I used clear packing tape that was on a tape gun to wrap it up tight and close off the wind from getting in the front side of the broken plastic outer shell for the original mirror. I am happy to report, that while it was not the best, it was a huge improvement over having nothing. We happily got used to this new temporary fix. I further facilitated our better viewing of what was going on behind us, by removing the head rests from the back seat. With the headrests removed, the view through the inside of the back window improved, just enough to have made this temporary move worth while. The car is in the shop having the new mirror put into place, and I can hardly wait to get it back. Even though the rental car is a brand new SUV, I must say I am spoiled with having the Hybrid. It is a great vehicle for our use. Here is hoping this little bit of pass along info will not be something you will ever have to use. However, It is now with you with my good wishes. All the very best, and please be careful out there on the roads. One never knows what will happen. PS: Taylor happily joins me, in sending along his best as well. Clever idea. I'll have to remember this in case the need ever arises. We had a blast with this one. I am glad everyone is ok, and the ingenuity here is not only funny but great stuff. How did you think of this? Great stuff! Wow how unfortunate to have something like that happen. 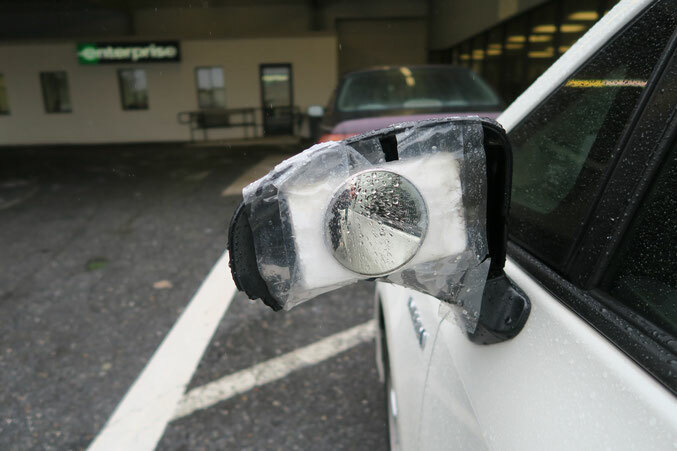 I supposed a single side mirror is a whole lot better than what could have happened. Really good idea with the temp replacement. I am so glad everyone is ok. Count your blessings, it sounds like it could have been a lot worse!!! I showed this to my brother. He's missing a mirror too. He said he was going to Home Depot to do the same thing. So on my brothers behalf, thanks for the idea.